A disturbed eruption process creates a clinical situation that is challenging to diagnose and treat. The clinical arena of tooth eruption disorders includes both syndromic and nonsyndromic problems varying from delayed eruption to a complete failure of eruption or sometimes retained primary teeth. 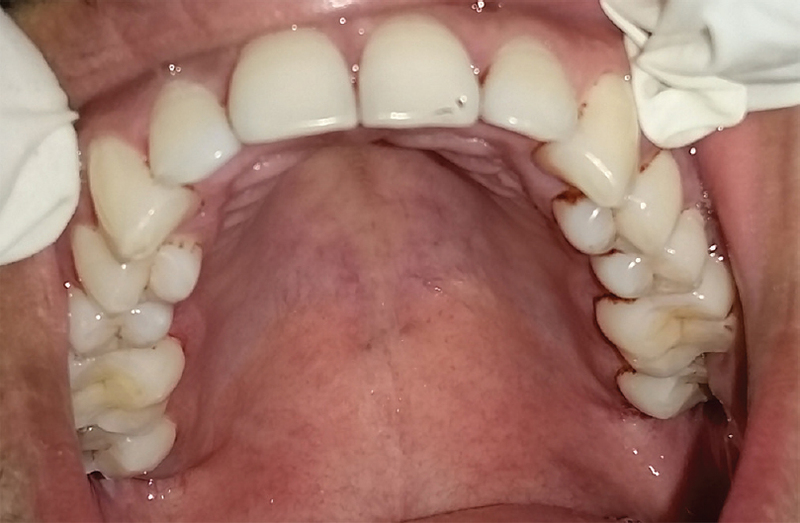 This paper reports a rare case of retained bilateral primary incisors on mandibular arch in a systemically healthy patient with eruption of the permanent central and lateral incisors bilaterally. This paper reports a rare occurrence of nonsyndromic bilateral retained mandibular primary incisors in a systemically healthy patient. 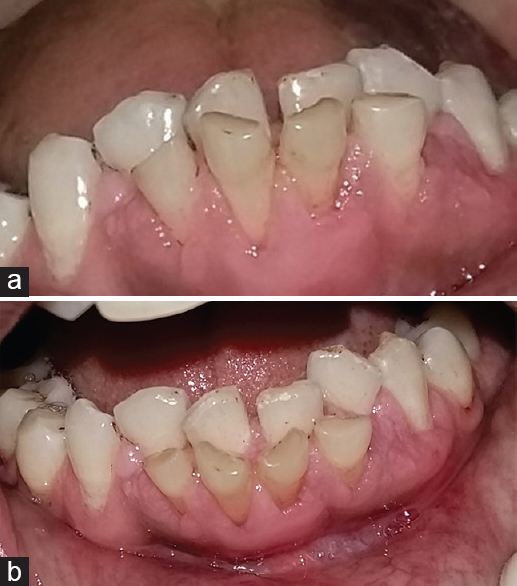 A 30-year-old male patient presented to the Department of Periodontology for a routine check-up and oral prophylaxis. On intraoral examination, there was crowding in the lower anterior teeth region. Thorough clinical examination revealed the presence of retained primary central and lateral incisors on both right and left sides [Figure 1]a and b. Further examination confirmed the presence of permanent central and lateral incisors on both sides placed lingual to the primary incisors. 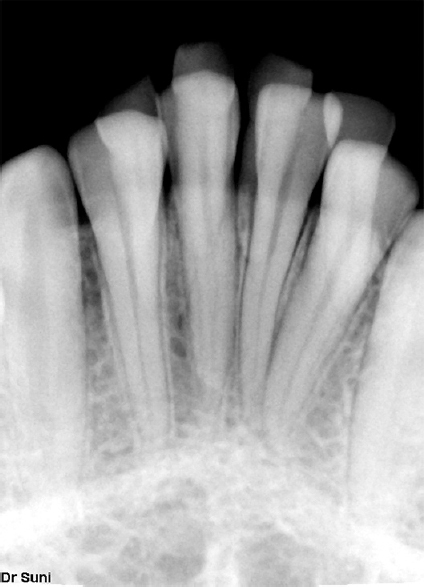 Radiographic examination confirmed the same on the intraoral periapical radiograph also showing the complete formation of roots of permanent teeth [Figure 2]. Medical and family history were noncontributory. The patient was asymptomatic except difficulty in maintaining the oral hygiene. There were no mobility or caries lesions of the over-retained primary teeth except gingival recession of primary incisors. Maxillary arch showed full set of incisors, premolars, and molars with no variations of retained teeth [Figure 3]. Treatment plan was discussed with the patient explaining the consequences of over-retained primary teeth. The patient was advised for the extraction of the primary incisors and further orthodontic alignment of the permanent teeth. Since the patient was asymptomatic, he was not readily willing for the extraction. However, the patient is under observation. Impaction of succedaneous teeth due to over retention of primary teeth has been reported widely in the literature. Involvement of both succedaneous and nonsuccedaneous teeth establishes a fact that failure of eruption of teeth or lack of eruptive forces led to retention of primary teeth. The presence of over-retained primary teeth is considered a consequence rather than a cause for the failure of eruption. Early diagnosis and necessary treatment of retained primary teeth would prevent the complexities in the further dental management. Over-retained primary teeth may pose difficulty in maintaining the oral hygiene to noneruption or delayed eruption of permanent teeth. Therefore, early diagnosis, proper evaluation, and appropriate treatment are essential. Treatment may vary from simple extraction to extraction followed by orthodontic treatment. This case presented a rare occurrence of retained primary incisors with eruption of permanent incisors as well in a healthy male patient. Cahill DR. Eruption pathway formation in the presence of experimental tooth impaction in puppies. Anat Rec 1969;164:67-77. Cunha RF, Boer FA, Torriani DD, Frossard WT. Natal and neonatal teeth: Review of the literature. Pediatr Dent 2001;23:158-62. Sletten DW, Smith BM, Southard KA, Casko JS, Southard TE. Retained deciduous mandibular molars in adults: A radiographic study of long-term changes. Am J Orthod Dentofacial Orthop 2003;124:625-30. Robinson S, Chan MF. New teeth from old: Treatment options for retained primary teeth. Br Dent J 2009;207:315-20. Shapira Y, Kuftinec MM. Intrabony migration of impacted teeth. Angle Orthod 2003;73:738-43. Aktan AM, Kara S, Akgunlu F, Isman E, Malkoc S. Unusual cases of the transmigrated mandibular canines: Report of 4 cases. Eur J Dent 2008;2:122-6. Aktan AM, Kara I, Sener I, Bereket C, Celik S, Kirtay M, et al. An evaluation of factors associated with persistent primary teeth. Eur J Orthod 2012;34:208-12. Zuccati GC, Doldo T. Multiple bilateral impactions in an adolescent girl. Am J Orthod Dentofacial Orthop 2010;137 4 Suppl: S163-72. Cooper SC, Flaitz CM, Johnston DA, Lee B, Hecht JT. A natural history of cleidocranial dysplasia. Am J Med Genet 2001;104:1-6. O'Connell AC, Torske KR. Primary failure of tooth eruption: A unique case. Oral Surg Oral Med Oral Pathol Oral Radiol Endod 1999;87:714-20. Dalampiras S, Christina B, Stanko P. Full retarded eruption of permanent dentition: Report of a rare case (8-year follow up). Eur J Dent Med 2012;4:34-7.